StarPac is a carefully controlled blend of high-tech greases and lubricants combined with modern fibers resulting in a superior product. Its malleable consistency makes it easy to use. It can be injected with high pressure gun or installed by hand. Unlike braided packing, no cutting is necessary. It will conform to any size stuffing box and seal it. StarPac's unique properties assure superior performance and deliver major benefits resulting in improved plant and equipment maintenance at reduced costs. Its ability to fill any crevice makes it an effective seal on worn or grooved shaft sleeves. Highly lubricous, StarPac requires no cooling or flush water. The operating costs of wasted water and product is eliminated. StarPac will run leak-free. A cleaner environment, meeting EPA concerns, can be achieved. The low coefficient of friction allows equipment to run cooler and consume less energy. 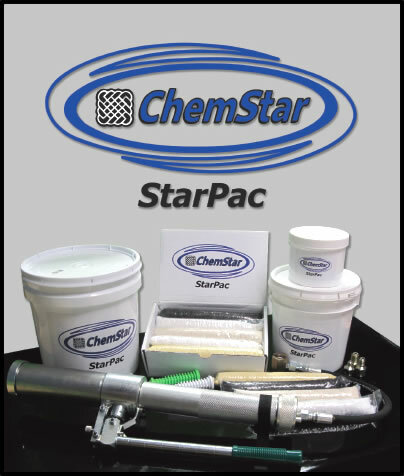 Highly versatile, Star-Pac is formulated in a variety of styles to meet the conditions found in almost any industry. There is a style suited to your needs; from high acidity to high alkalinity (0 to 14 pH), temperatures to 1200°F (649°C), pump pressures to 300 psi (20 bar). A non-staining, non-contaminating style exists which meets FDA standards for food contact and potable water applications. StarPac pump sealant is available in 2 lb. and 5 lb. containers for initial loading and in 1/2 lb. sticks for final sealing under pressure with or without our gun. Injection gun will help eliminate unwanted voids in the stuffing box and allow sealant to be added while equipment is running. Shut off seal water and lube inlet and install button head fitting. Remove old packing and lantern ring. Inspect and clean shaft and gland. Install compatible braided packing ring in the bottom of the stuffing box; cut on 45° angle from top to bottom. Pack sealant tightly insuring there are no voids. Add StarPac until just enough space is available to install braided top ring in the stuffing box. Hand tighten gland bolts, very snuggly, turn on pump and let it run for 15 minutes. If any leakage should occur, gradually tighten gland bolts, one flat at a time, until all leakage stops. Do not over tighten. In valves, simply remove old packing, install braided ring, add StarPac, install top ring, snugly tighten follower nut. Occasionally, pump may require additional sealant. This can be done by removing the gland follower and top braided ring and adding more StarPac. Even more conveniently, use the Injection Gun by connecting it to a button head or easy flow fitting installed in the pump flush water port. Loosen the gland follower nuts and inject StarPac until the stuffing box is filled. 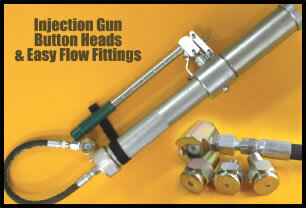 The Button Head fitting contains a ball check which will allow sealant to be added while the equipment is running. StarPac 352IP Cream, natural fiber with grease additive, suitable for wastewater, slurries, sewage. Temp. 205°C/400°F, pH 2-12, Speed 457 mpm/1500 fpm, Pressure 17 bar/250 psi (rotary/centrifugal), 83 bar/1200 PSI valves. White PTFE sealant suitable for food and potable water. Temp. 500°F, pH 0-14, Speed 1500 fpm, Pressure 300 psi (rotary/centrifugal). StarPac 365IP Black PTFE high performance sealant containing GFOTM, for use in high speed applications. Temp. 500°F, pH 0-14, Speed 4300 fpm, Pressure 300 psi (rotary/centrifugal). Black High Temperature sealant, blended with flexible graphite. For use in hostile environments, high temperature pumps and valves. Temp. 1200°F, pH 0-14, Speed 4000 fpm, Pressure 250 psi (rotary/centrifugal). StarPac 370IP Yellow sealant, blended with Aramid Fibers. Excellent for abrasive environments. Temp. 500°F, pH 2-12, Speed 3000 fpm, Pressure 250 psi (rotary/centrifugal).